I first started float tubing back in the mid 70s. In those days there were only a couple of companies producing tubes commercially. They relied on a truck tire inner tube for floatation and were relatively small compared to todays model. You were in theater from the waist down and, with the primitive waders back then, it was cold and uncomfortable fishing. We loved it! Fast forward to today and you have a myriad of boats available from many manufacturers and they keep you up out of the water for a more comfortable experience and we still love it! At the shop we settled on the Outcast brand of boats because of the quality, customer service, and durability of their products. As a retailer, when a manufacturer can give you good value and less headaches you stick with them. My current boat is a Fishcat 4 Deluxe which suits most of my personal needs. It’s lightweight, rugged and packs down pretty small to fit easily in my Prius. I had an older Outcast Oncilla pontoon boat that I used for group trips where i needed to get around and check on my clients but, with my lower back acting up on occasion, it became just too heavy for me to handle comfortably by myself. This past weekend I took a group of customers/friends to a small private lake in the Santa Ynez Valley and was able to borrow a Fishcat Scout from my Outcast rep, Alex Ramirez to test out. These boats are a light ,frameless pontoon boat that have been on the market for a couple of years and, though we sell them in the shop, I had not had the opportunity to fish out of one. The first thing I noticed was that it was, comparably, very light weight, just 35 lbs, and were very easy too inflate with just two air chambers. The pontoon chamber is quite large so an electric inflator would be a nice extra. The foot rest bar is a little tricky to get in place with cold hands. Maybe they should supply some vaseline or liquid soap to was this part of the assembly. Other than that, adding the oars is simple and it was a breeze to assemble and easy to carry to the stare’s edge. The large deck air chamber sits you nice and high off the water and allows good fishing visibility and excellent comfort with the adjustable seat and back rest keeping me upright and comfortable all day. As with many modern day personal floatation devices, a long handled landing net was handy to get to the fish over the large pontoons. All in all, very easy to assemble and a joy to fish out of all day. May have to invest in a new toy. We have just received some fine used and highly collectable rods and reels in superb condition. These are being offered to our local customers first before being listed online. Check out the list below and call (818) 785-7306 with any questions. Gary H. Howells Rod Co.
To bamboo aficionados Gary Howells was one of the greats. He learned his craft with R.L. Winston in San Francisco before setting up his own shop in the Bay Area. It is rare to find three outstanding specimens of his work for sale at the same time. 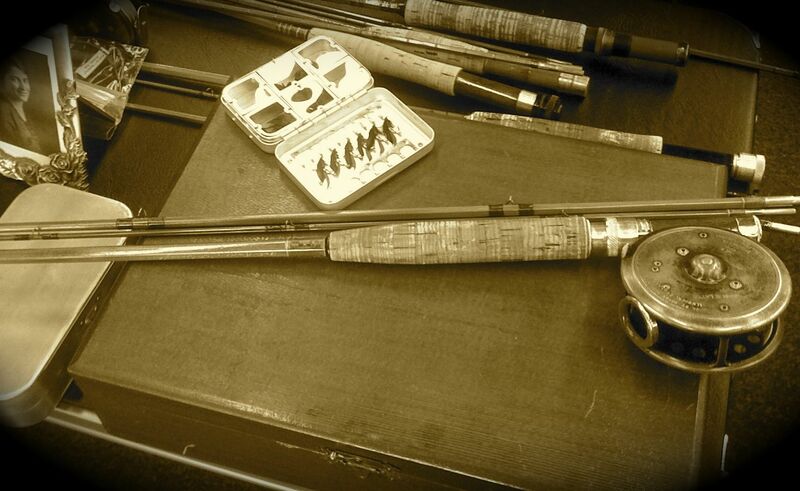 These rods are pristine works of art that are totally fishable today. 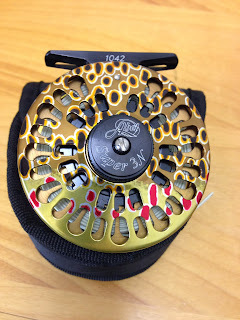 All reels are EX condition with lines also in EX condition. All very usable and ready to go with line installed. Come see and cast the new Hardy and Grey's Fly Rods including the Jet, GR50, GR30, & GR10 as well as the new Hardy Bougle reel. Cast the hot Sintrix Zenith and Proaxis fly rods with nano technology. In addition Sunday brings a gathering of cane artisans and fishing collectors from as far away as Utah to compare, share, trade and sell all things vintage. Join us! Many Previously Owned Reels Available from Abel, Hardy, Bauer, Marryat etc. Stop by the Spot this holiday weekend for some great deals on clothing and gear. We will be open regular hours on Saturday and Sunday and 11 a.m.- 3 p.m. on Monday. Select waders from Orvis, Simms, and Redington closeouts. Great selection of used gear from Abel, Ross, Lamson, Sage, Thomas & Thomas and more. In addition, if you spend over $100 on regular priced merchandise we will pay your sales tax. Sale prices start Friday 8/30 and ends at close of business on Monday 9/2. Have a safe holiday weekend. Steve and I were walking through the Fly Fishing Dealer Show in Denver a few years ago and as we passed one of the booths the guy behind the counter said “Hey, have you ever seen anyone do this with sun screen?” and he proceeded to smear it in his eye. If you’ve ever had regular sunscreen trickle into you eye you know how badly the stuff can sting. Our intrepid salesman merely wiped his eye with a tissue and smiled “See? Doesn’t sting!” he declared. He got his desired result. 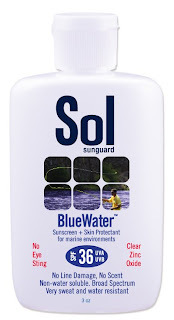 We stopped and had closer look at his product, Sol Sunguard. My first question was “ Yeah, but does the sunscreen work?” As an answer he gave us some samples to try. Since then it is the only sunscreen that I use. 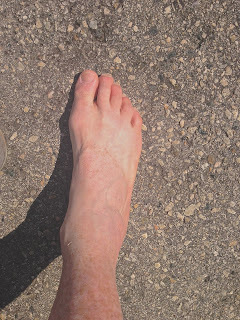 My foot after a very hot day on the water. No burn! When I was a kid I spent many a painful night with sunburn and was very aware, after a few bad burns, about the negative effects of UVB and UVA rays. 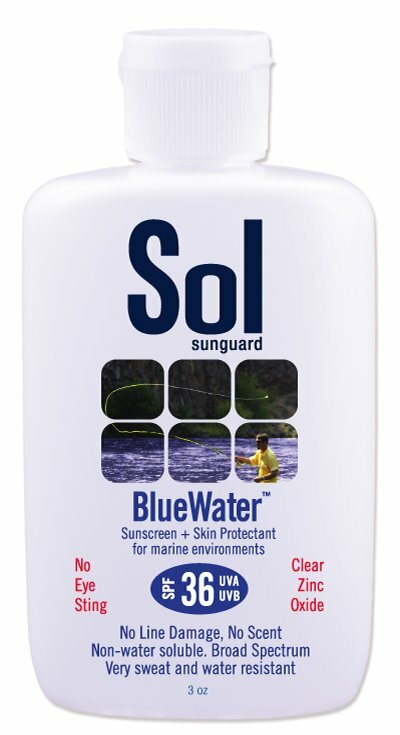 I have never used a product as effective a Sol Sunguard. The product features microfine zinc oxide that offers transparent and complete protection, I just spent a very hot day yesterday in my boat in shorts and flip-flops with no effects in terms of sun burn. 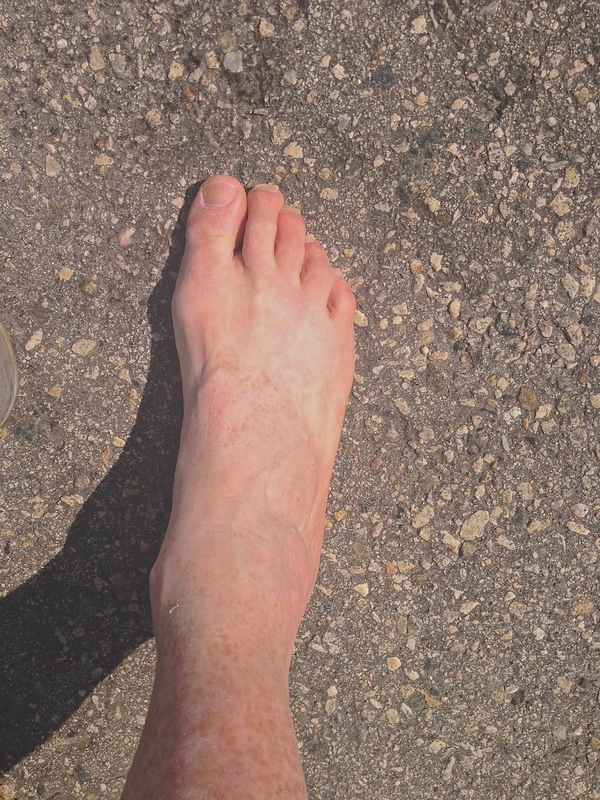 The skin on my feet and the backs of my hands are particularly susceptible to the sun’s rays but with Sol it’s not a problem. To make it even better, it isn't greasy, won't effect your fly line, has no odor and is non water soluble. Make sure you take care of your skin with appropriate clothing and the best sunscreen on the market. There's A Cane Gathering Too! In addition, Robert Bolt will be in our shop that weekend. Robert makes one of the finest bamboo rods on the market today. If you like Gary Howells' rods, you will love a R.K. Bolt fly rod. Robert bought all the remaining Howells' stock and has also developed his own interpretation of a Howells. We will have some in store specials that day as well including: We Pay Your Sales Tax on all Hardy/Grey's products over $100. There will be a real treat as well with fly tying demonstrations with a great tier, our own fly tying instructor, Glenn Hiroyasu. Plus, Captain Vaughn Podmore (Saltyfly Guide Service) will be here tying flies and talking about local offshore fly-fishing. Vaughn has more than 20 years experience fly- fishing and fine-tuning our local waters. From novices to experts, he will use his local knowledge and skill to give anglers a memorable experience. People will be coming from all over California to show off, trade or sell Bamboo Fly Rods as well as collectable fly- fishing equipment and ephemera. This year we have invited cane rod builders and cane rod collectors. This should be a major showing of what is available in California cane. And if you have the old fly-fishing stuff for sale, bring your own table and chairs and join us. This year’s get together is being hosted by the “Fishermen’s Spot” (steve@fishermensspot.com) and Russ Gabel (rgabel@frazmtn.com)Frazier Mountain Fly Fishing Company.